All the products that we sell are guaranteed 100% AUTHENTIC or your money back. Yes, we offer 100% Money Back Guarantee but only for issues with regard to authenticity. Only counterfeit claims by a credible store manager or supervisor of the boutique carrying the same brand of merchandise will be honored for a full refund. You will have 14 days to return the product and it must be returned in the same condition that it was bought. Otherwise, all sales are final. How much shipping fee do I pay? We ship orders via LBC Express (cutoff 4PM) with mandatory insurance. We will not be responsible if item gets lost in transit. Actual shipping cost inclusive of insurance will be shouldered by the buyer. Please contact us first prior to paying so that we can quote you actual shipping fee with insurance to your location. We ship orders via LBC Express. Transit time for Metro Manila addresses is 1 to 2 business days after your order has been dispatched, while transit time for Provincial addresses is 1 to 3 business days after your order has been dispatched. Please note that Saturdays, Sundays and holidays are NOT considered business days. Also, transit times given are based on committed transit times of the courier and delays sometimes do occur on their part. If it is imperative that you receive your order on or before a certain date, please consider increasing your lead time by placing your order in advance. Within the next business day of shipping your order, we will send you an email and/or text message containing the tracking number of your order. You may track your package at the LBC Express website. Please allow 1 business day after your order has been dispatched before it becomes trackable online. We accept BPI or BDO bank deposit/transfer. Should I contact you to inform you that I had already sent payment? Yes, you will have to inform us that you have sent payment by sending us a text message containing your payment details at 0917 866-8388 or 0922 866-8388. Please note that in case there is a problem with the payment you sent, we will require proof of payment. Please keep a copy of the deposit slip or screenshot of the details of the payment that you made for your reference. What if I don't like the product I bought, can I return it for a refund or exchange? Sorry, we do NOT offer returns simply because you do not like the product you purchased. As with any other product which you buy online, it is your responsibility as a customer to do a "due diligence" on whether or not the product will suit you prior to purchasing. I think that the product I bought is not authentic, how do I return it? I received a wrong product, what do I do? If you received a wrong product, you must inform us within 3 business days of receiving your order by sending us a text message at 0917 866-8388 or 0922 866-8388. Rest assured, we will get back to you as soon as possible in order to rectify your problem. How do I know that you can be trusted with my hard-earned money? Porto Di Moda Designer's Haven is one of the pioneer online stores in the Philippines. We have been selling designer bags, fragrances, eyewear, shoes, watches and accessories since July 2005 and have served literally thousands of customers since then. Still not convinced? Click here to view our reputation on eBay Philippines where we have amassed over 8,000 positive feedbacks since we started selling there in 2008. 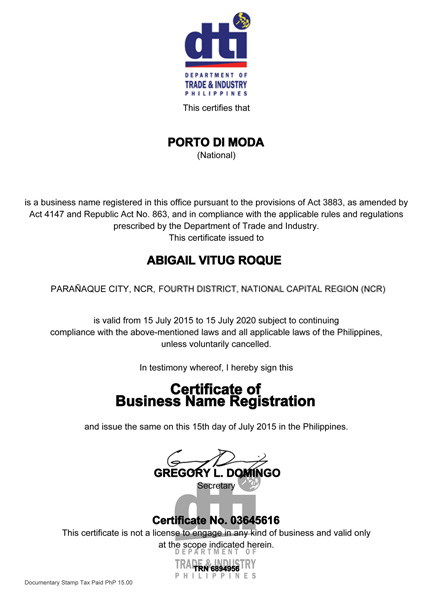 Our business is registered with the DTI with validity until July 15, 2020. Do you sell on any other online marketplace? We also offered discount deals via the Groupon Philippines platform until they ceased operations in September 2015. At Groupon, we were able to serve hundreds of their customers and offered them savings of up to 70% on 100% AUTHENTIC Perfumes and Vitamins & Supplements.